The workflow starts with Drips, a scheduler (cron) where key value-pairs (KVP) is created at certain time. 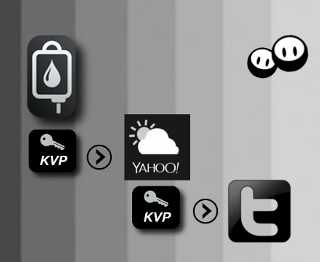 A rule script (yweather) is triggered when this KVP is created. The weather results are sets of later KVPs feeding the twitter rule script where our simple Nebri workflow ends. This is how I get multiple cities, by using different Drips, different events, running the same workflow. Both yweather and twitter scripts are also example of API connectivity to Nebri. Many things already taken care by Nebri, hence unseasoned programmer should easily cope with writing simple Python rule and focus on the automation, nevertheless complex rule should also be accommodated. I was having trouble on using previous KVP from different PID though–moved them to comment in the script, but they seem to be working on it. Check their YWeather blog post on how the basics work and compare what I did in Github. I embed an example tweet from @twithujan below. Yahoo! Weather frequency of measurement and accuracy are of different topic by the way.